A few months ago Paul and I got to meet KariAnn from Thistlewood Farms. She designed some fabric for Hoffman Fabrics and was at our local quilt shop to show off her fabric line. We had a blast, she's such a character, and we both got a stack of charm squares since we were some of the first people there. I have been pondering what to do with my squares and realized I haven't made myself a new bag in a while. Summer is such a busy time for everyone and I didn't want to spend a lot of time making the quilted bag. The charm squares help to cut down prep time making this a quick and easy quilted bag. This little bag is my favorite beginners' project. Since it uses precuts there's little cutting involved and the sky is the limit with these bags. For this bag, I opted to turn my charm squares into half square triangle but you don't have to. You can leave the charm squares as is and put eight whole squares on each side. If you leave them whole your bag will be slightly bigger than mine. By now you know that I love denim and this time I'm using some denim scraps that remind me of jeans I had a long time ago. It's always amazing to me how fabric that is so dated, denim with flowers embossed on it, doesn't look dated when cut into three-inch strips. It also pairs well with the floral fabric. It also means that this dated denim isn't headed for the landfill. So many clothes end up in the landfill that we, as quilters, could be using in projects. Like Bonnie Hunter says, "There is no ugly fabric only fabric that needs to be cut smaller." 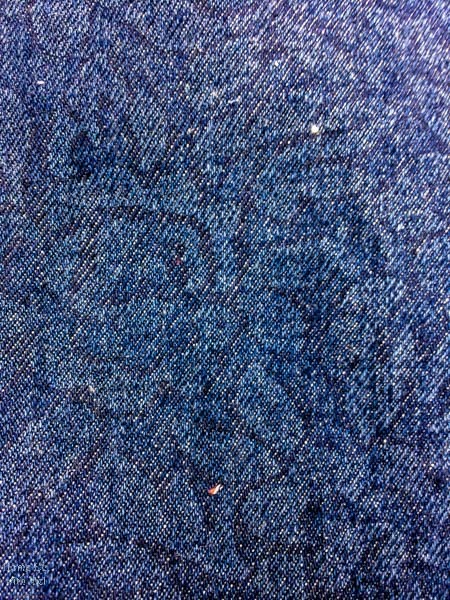 Denim with flowers and I know it is hard to see them. I tried really hard to get them to photograph. Now the lining is another place where you can go crazy. I used some fabric I had in my stash that I thought went well with the fabric on the outside of the bag. Since this is my go to project for helping new sewist and quilters get started I have helped make this bag numerous times. Most have stayed with quilter's cotton for the lining fabric but my sister in law picked some faux fur we had. Let your creativity fly with this quilted bag. The construction will be the same but pick charm squares, denim, and lining fabric that speak to you. Honestly, this project should be zero cost. Even if you don't have any charm squares laying around I bet you have some fabric that can be cut into 5" squares. 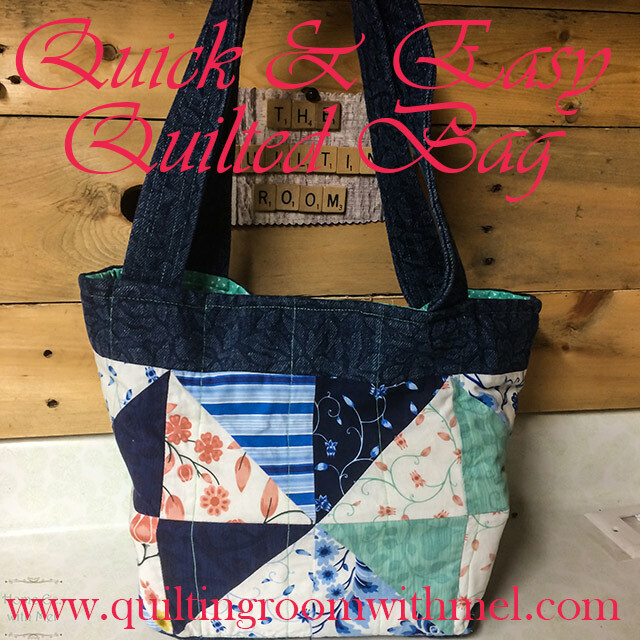 So are you ready to make your own quilty bag? Now I try to have all of this cut and ready to go. That way when the new quilter is ready to start they only have to focus on the actual sewing and quilting. They can pick their charm squares, pick their denim, and pick their lining. Also having all the parts ready to go means anytime I want a new bag it's just a quick grab and I am ready to go. We are starting making half square triangles. If you haven't made half square triangles before just follow the video below. I did not set my half square triangles as a pinwheel. When you sew your four half square triangles together I highly recommend you spin your seams. 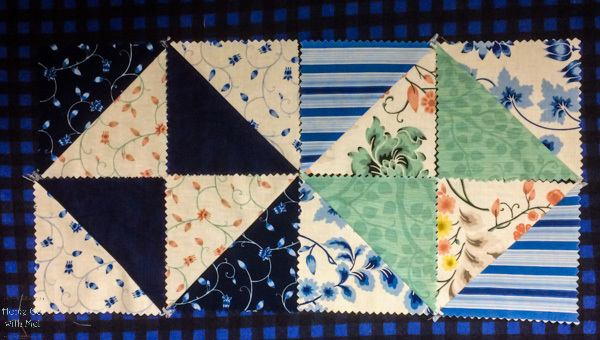 Doing it just makes your block lie flatter and helps with quilting later on. I also spin the seam when I sewed the two blocks together to make each side of my bag. 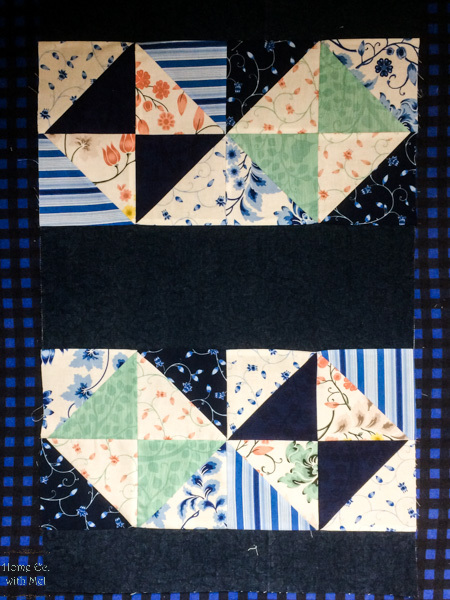 Once you have your half square triangles made you can decide how you want to put your blocks together. I did two rows of four blocks. I did light and then dark toward the center because that's what looked good with my fabric. Play around and figure out what looks good to you. The four center blocks will actually be the front and back of your bag. Keep that in mind when laying out your half square triangles. The 3" wide strips are the top of your bag and the 8 1/2" wide piece is your bottom. So your layout is 3" denim strip, HST panel, 8 1/2" piece of denim, HST panel, 3" denim strip. Once you have it sewn together measure your bag and cut your lining the same size as your bag. Cut your batting about an inch bigger. I don't pin my top to my batting, I use either basting spray or hair spray, depending on what I have on hand. For the quilting I need straight line quilting on the sides only. I didn't quilt the bottom. I did follow the seam, stitch in the ditch, along where the bottom and HST panels were sewn together. This will come in handy later when we square off the bottom of our bag. I used a washable marker to give me a guide. I can't sew straight without some sort of a guide. I used a walking foot for this to keep everything feeding easily. If you've never used a walking foot before you can see how they work below. Do not use reverse when you are using a walking foot!!! So now it's time to turn this rectangle into a bag. To construct the bag we are going to us 1/2" seams. Fold your bag in half, line up the top edges use pins if you need to, and stitch down each side. I know it doesn't look like a bag right now. We need to square off the bottom. To do that we are going to open the bag up and pinch the bottom to make a triangle. Be sure to have you side seam centered. Measure 3" from the tip of the triangle back towards the bag. Draw a line and stitch on that line. Repeat on the other side. Trim off the triangle leaving about 1/2". The lining is made in the exact same way as the bag. If you want pockets now is the time to add them. Pockets are a bit more difficult so I don't have beginners do them. 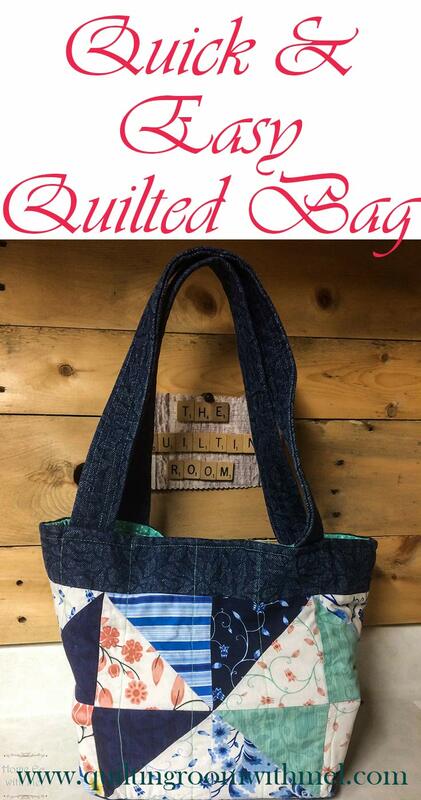 This is a dump bag meant to get a new person interested in quilting. Add pockets, don't add pockets it is up to you. Before we put our bag together we need to make straps. I cut my straps 6" wide x 22" long. Your straps may be a different length depending on how long you want your bag to hang. I'm fairly short so the bag bottom hits me just above the waist. By using the denim my straps are nice and sturdy just by adding the four rows of stitching. The stitching adds a bit of interest to the straps and it does add a bit of stability. Fold the straps in half, wrong sides together, and press. Open it up and press each side to the middle and fold in half again. All of your raw edges should now be enclosed. Stitch 1/4" from the each edge and then 1/4" from that line. You should have four lines of stitching. Now it's time to put your bag together. I honestly thought I had filmed this part but I must have forgotten to push the button. It's simple though, turn the lining wrong side out and put your bag inside it. Your straps go between the lining and the bag. Pin your straps in place and sew around the top of your bag with 1/2" seam. I also pin the lining to the bottom of the bag. I find it keeps the lining from slipping. Be sure to leave an opening so you can turn your bag out. I did remember to push the button for when I turned the bag out. It should help you understand how to put the bag together if written instructions aren't your thing. Once your bag is turned top stitch across the top to close the opening. I find it easier to top stitch if I give the bag a good press first. That's it your bag is done. Beginners can do this in an afternoon so it's the perfect Saturday afternoon project. Kids love making bags for themselves, mom, sister, or friends. If you make a bag for yourself or help someone make a bag share it with me. My social media links are at the very bottom of this post. If you'd like to get more tutorials like this or help with your sewing machine be sure to sign up for our newsletter. I'll send you a free sewing printable to decorate your sewing area. Be sure to hit the share button or pin the image below so others can make bags for themselves.